Nowadays, all you need to do in order to open your garage door is to press the button on the clicker or the remote. Heck, if you have an opener with smartphone connectivity, your phone is the only remote you need. This convenience can save you a great deal of time. While automation is certainly a huge advantage, it also comes with a set of safety requirements. You have to take into account the vulnerabilities of your automatic system and take special measures to make sure it stays safe and secure. When the door closes automatically, it might accidentally hit an object, a pet or even a person that gets in its way. The risk of this happening was reduced to the lowest minimum with the induction of the UL 325 safety regulation. This requires that all modern openers come with a pair of safety sensors, otherwise known as photoelectric eyes. They are attached to the bottom sections of the vertical tracks and detect objects passing under the door during closing. When that happens, they signal the opener to reverse the door. 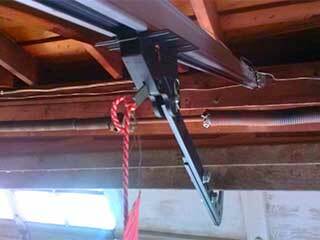 The maintenance of the sensors is essential for keeping the garage door safe to use. You should clean them and test them to make sure they are properly aligned. This involves waving an object (like a broomstick) in front of the sensors while the door is closing. If the system doesn’t reverse, the sensors will need repair or replacement. Another fundamental safety measure is to have the opener wall switch set up at least five feet off the floor. This will make it unreachable for young children and prevent them from playing with the controls, which can be extremely dangerous. It's important to explain the dangers the door poses to your children and to make sure they never treat it's remote like a toy. The opener won’t open the door without the correct access code. That is why it makes sense to change it at least once a month to ensure that no one will be able to guess it or learn it and use it to break into your house. Of course, if you have an opener with rolling code technology, this will be done for you automatically each time you use the remote. Brands like LiftMaster and Genie offer this technology as a standard feature for most if not all of their models. If you're interested in getting a modern opener model installed, or need to have your current unit repaired, there's no one better to call than our professional technicians at Garage Door Repair Trumbull.